Today’s quake was found out to be originated at a depth of 10 km at 15:25 GMT on Friday (01:25 on Saturday local time). It followed a series of small tremors. After that, the government issued a tsunami warning, but it was lifted up in less than an hour. Japan is one of those countries which faces earthquake frequently. But, thanks to their stringent building codes, they rarely face significant damage. Reports have just come in suggesting that some people got trapped in collapsed buildings after the latest quakes. It happened in the Kyushu region of south-western Japan. As some earthquakes have been witnessed, so it’s now difficult to say which building got affected by which quake. A wider area has been hit now. 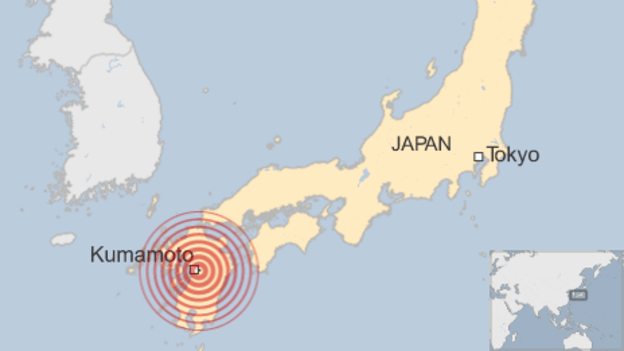 The officials of the seismology of Japan said that the quake which hit Japan on Thursday was 6.2 on the Richter scale. It has shaken some regions as if it was an earthquake from 2011. That quake resulted in the doubt of a massive tsunami and nuclear meltdown at a power plant in Fukushima. The majority of the people who died a day earlier belonged to the town of Mashiki. An apartment building collapsed and many houses were damaged. On the whole, more than 1000 people were reportedly injured. The figure may be high. About 40,000 people left their home in fear and spent the night outside. As many as 130 aftershocks had hit the area after that quake. It’s where the only online nuclear reactor of Japan is located. Stay tuned for latest Japan earthquake news and updates.